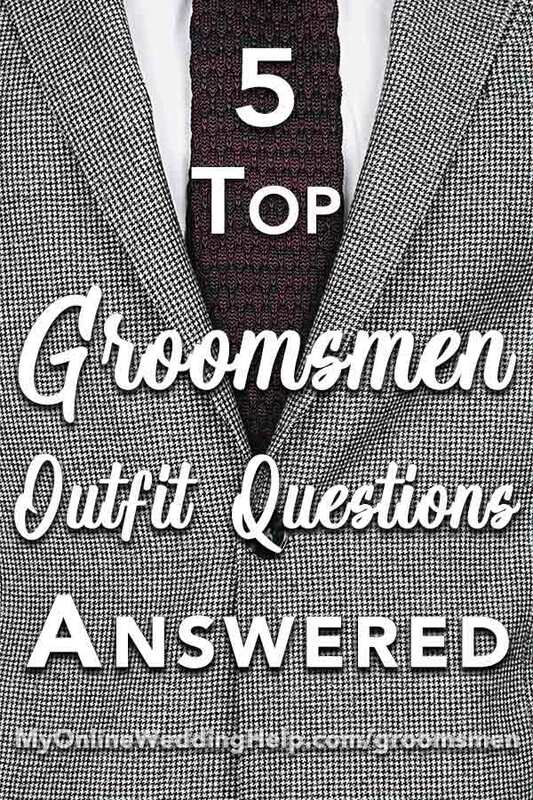 1) If not tuxes, what DO the groomsmen wear? a) Mimic the bridesmaids’ trend of having each wear the same color but choosing her own style. You can dictate the groomsmen’s color (navy blue, gray, black, etc.) and have them wear their own suits. Tip: If the color has many variations, collect some swatches that are in your “approved range” to give them. This will avoid off colors that do not blend as you’d like or more light/dark variation than you’d planned. b) Let groomsmen choose informal attire they can wear in everyday life. Like a mix and match of nice blue jeans, suspenders, and button-down shirts with jackets and ties. c) Skip the jackets completely and go with suspenders or vests. Pair with white or colored shirts, and matching pants. d) Pick nice-looking but inexpensive suits that are also appropriate as normal dress wear. Your groomsmen can then wear them to future events. 2) Is groomsmen attire rental a thing when there are no tuxes? Absolutely. If the men aren’t the type to wear their wedding suits later on, it may be cheaper to rent them. Some tuxedo retailers have suit options for many of today’s less-than-formal weddings. But then you are back to the added work of coordinating with and returning to a physical store. If you like the idea of renting but not the logistics, there is not another option: renting online. Generation Tux, for example, lets you and your groomsmen customize and fit entire outfits from home. The guys then receive their suits in the mail. They’ve done this over 200,000 times, using their eTailor technology. The 4.9 out of 5 star rating on Wedding Wire confirms they know what they are doing! If a piece happens to be the wrong fit, you can get a replacement. The cost to rent a groomsmen suit or jacket begins at under $100 before the discount. The dapper groomsmen in the photo above is wearing the indigo blue Notch Lapel suit. You can customize the look to fit your own personality. 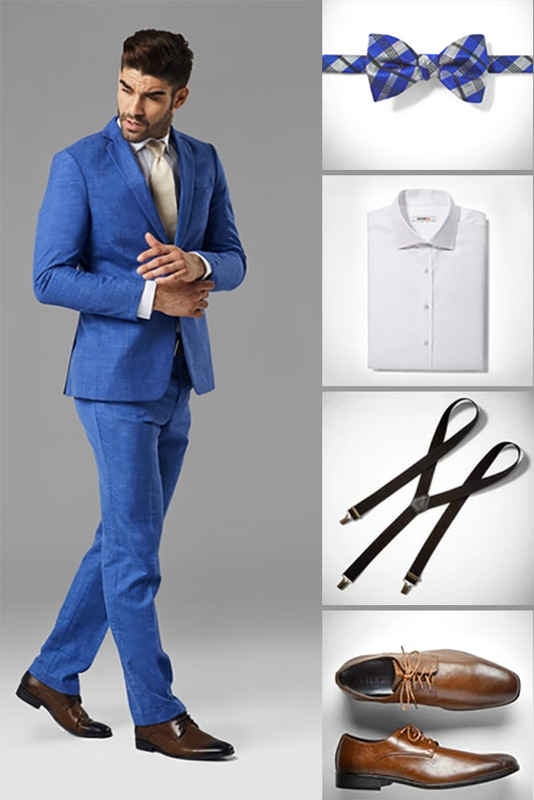 Choose, for example, a bow tie and suspenders instead of long tie and belt for a more casual look at the reception. Need a discount code? To get 20% off your rental click here and take a look at suits for rent. Use the discount code BPOWH at checkout. Plus, the groom’s tux or suit rental is free. 3) Do groomsmen pay for their own suits or outfit? Sometimes yes, sometimes no. Members of the wedding party, including groomsmen, often pay for their own attire. But it depends on what you want to do. If you and your fiance would like to pay for all or part of their ensembles, go for it. Another approach is to have the guys pay for their outfit, but buy one or more pieces of the ensemble for them. Custom accessories, like personalized groomsmen cufflinks make great wedding party gifts. Or decide which specific piece you would like to be the same for all the groomsmen and buy that. 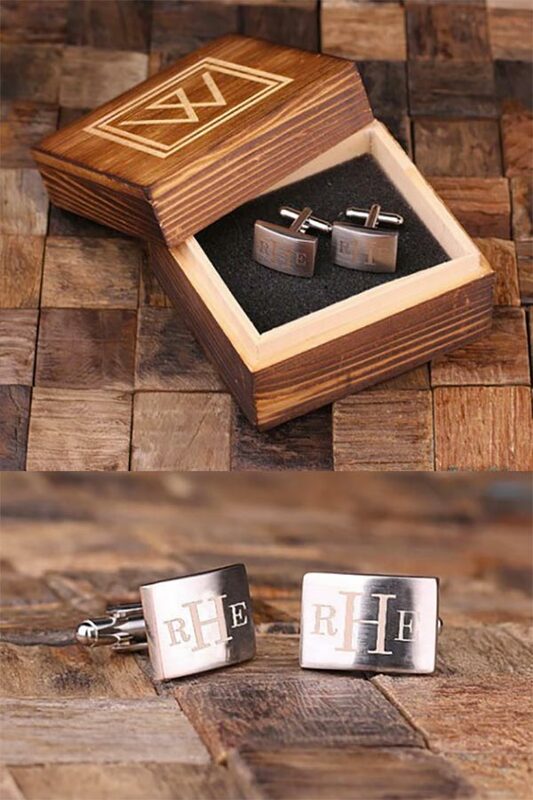 Tap here to read about and buy the monogrammed cufflinks above in a wood gift box. 4) What about the best man? Does he wear the same thing as the groom or the groomsmen? The best man is a special groomsman, chosen because he is close to the groom in some way. For this reason, he often stands out from the others. Do this by having him wear a suit or clothes similar to the groom but contrasting in some way. Or vary the color or style details for the best man. The choice is yours as long as the groom, best man, and groomsmen create a cohesive look. Viewed together, they should look like they belong as a group. And the groom and best man should be noticeable as Head Dude and Special Dude, respectively. 5. What are some non traditional groomsmen attire ideas? Non traditional groomsmen attire often relies on accessories. Each has the potential to add flare to an otherwise ordinary outfit. The guys’ accessories include, at a minimum, socks and shoes. Cufflinks, ties, suspenders, and/or a pocket square may also be part of the mix. Here are a few ideas for how the groomsmen can wear their everyday dress suits or pants and shirt. But “oomph them up” with accessories. Suspenders. These create a different look and can even be worn without jackets for a more informal, yet still dressed-up look. Vests. You can rent them (see number two above) or, if you or one of your helpers is good with a sewing machine, have them custom-made. Bow ties. Novelty ties, with dots or patterns, are a quirky way to add dimension to an ensemble. Unique socks. 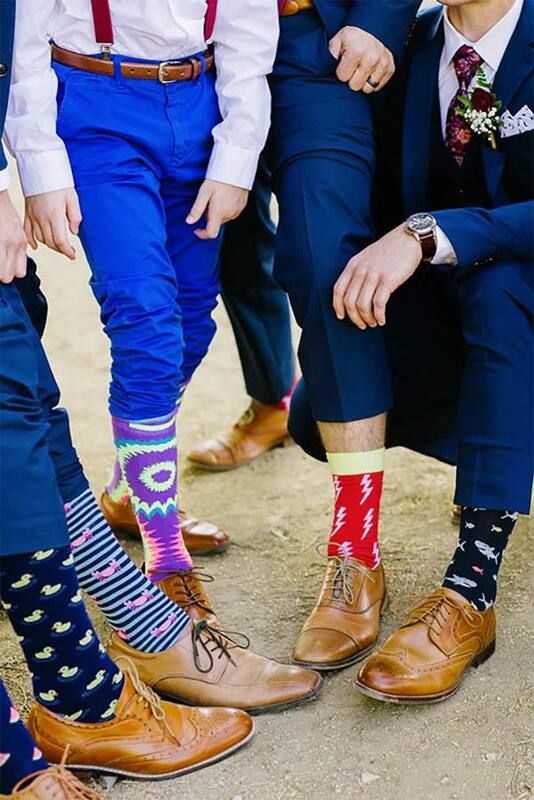 Add interest to otherwise nondescript outfits by having the men wear colored or playful patterned socks. The socks in the picture above are from the Ties Novelty Socks Collection. Tap here to see them. Pattern shirts. These can also serve to elevate a look while also keeping it somewhat informal. Pair with slacks for polish or jeans for a rustic wedding. To get some ideas for the men in your wedding, take a look at the Groom and Groomsmen pinboard here.